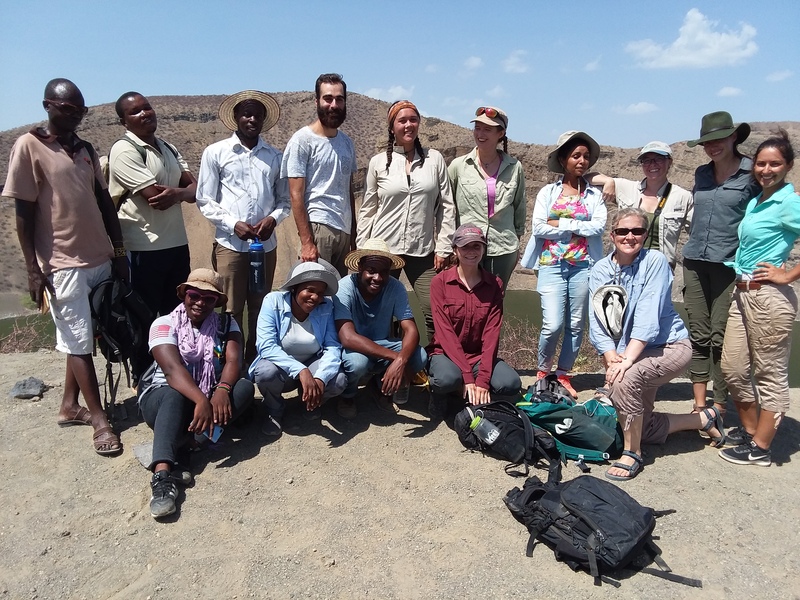 As part of their study of the evolution of apes in East Africa, field school students visited a series of geological sites on Wednesday that have yielded fossils critical to that evolutionary history. The Lothodok (or Losodok) range extends along the western border of Lake Turkana, appearing as a series of high ridges or low rolling hills whose erosion has exposed sediments millions of years old. 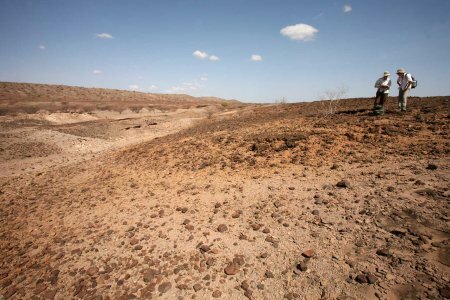 The sediments were deposited by ancient rivers, floodplains or catastrophic ash and mud flows, preserving beautiful minerals, footprints, and a multitude of fossils. Included among them are the famous Turkanapithecus and Afropithecus speciments, both potential ancestors of modern apes. 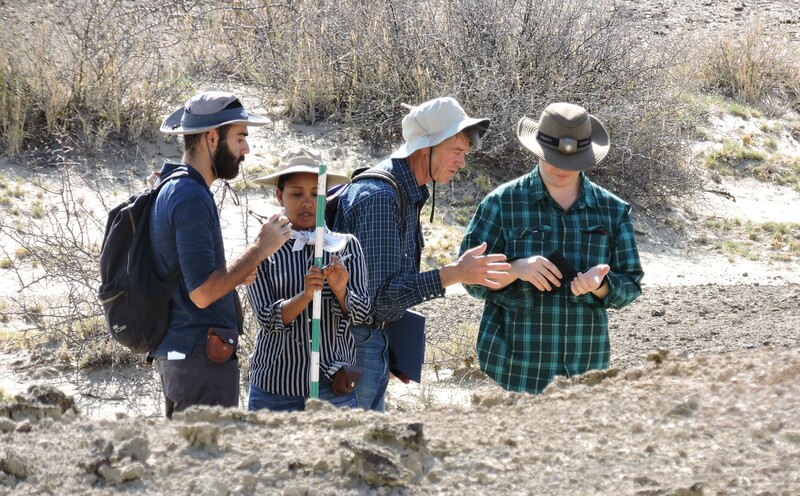 Cara Roure Johnson and Meave Leakey led students to explore these geological formations and hunt for fossils, beginning their expedition at the Kalodirr beds north of the Turkwell River. Cara Roure Johnson and Meave Leakey at Kalodirr on the Losodok range. 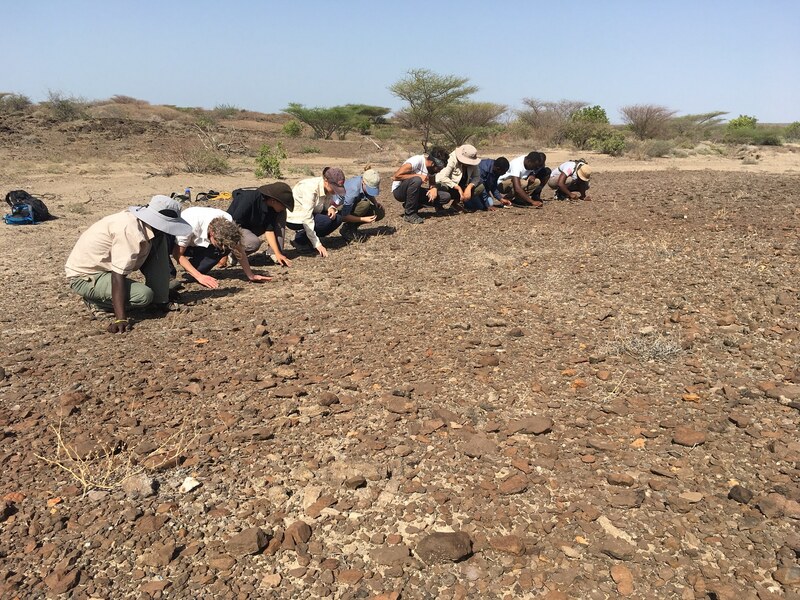 Field School students began their hunt for fossils at Kalodirr, a 17 million year old series of sand and rock exposures running north and south, parallel to Lake Turkana. 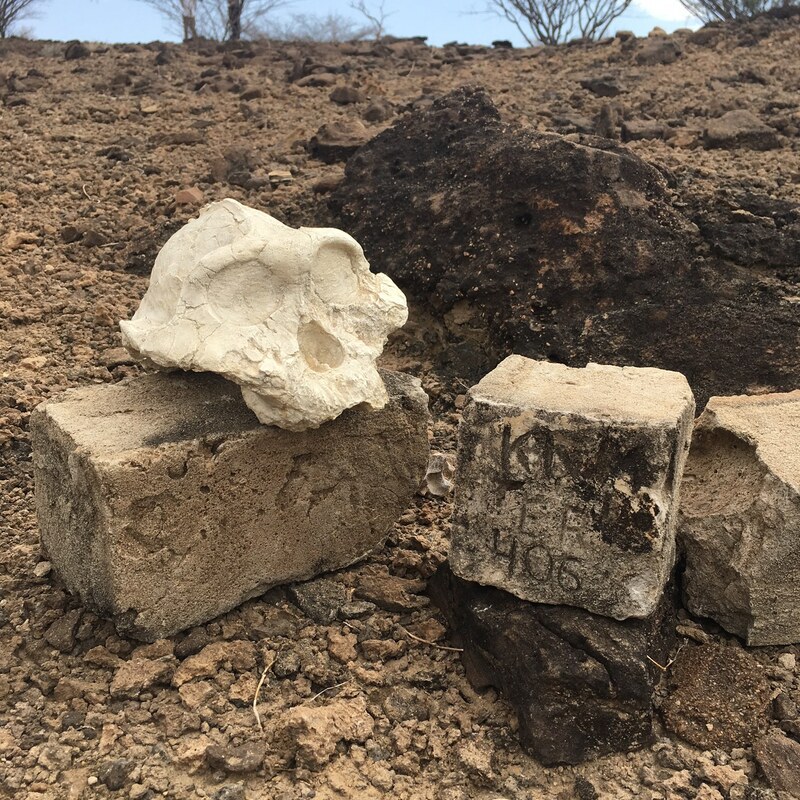 Kalodirr is notable for its many layers of volcanic ash, sometimes having fallen while hardly mixing with other materials, and other times entering into catastrophic mudslides called Lahars, entraining with them all kinds of debris. These beds formed quickly, and preserve animal tracks, fossils, and even imprints of organic matter including ancient fruit. Instructor Cara Roure Johnson finds a fossilized gastropod at Kalodirr. While most paleontologists come to Losodok looking for primates or other vertebrates, Steven Jay Gould famously arrived and found only snails, in which he had far greater interest. Above, Cara holds up a gastropod for students to see. Cara Roure Johnson and Meave Leakey standing above Losodok’s Kalodirr Member. Cara and Meave begin to find fossils. 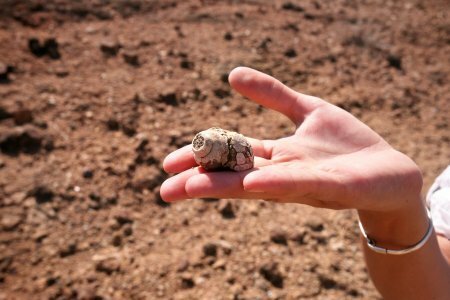 While paleontologists may search hours without finding fossils, a single bone can turn their luck around. Above, instructor Cara Roure Johnson and Meave sit down to collect a great many bone fragments found atop this small exposed bed. 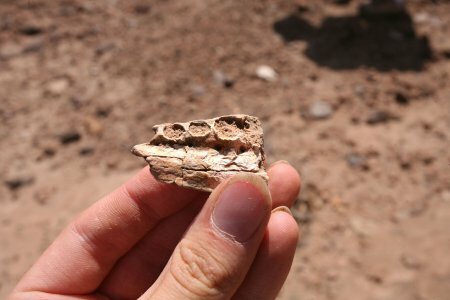 A small jaw bone, belonging to a fossilized baby crocodile. Students and staff take shelter from the heat beneath the shade of a tree, or a truck. 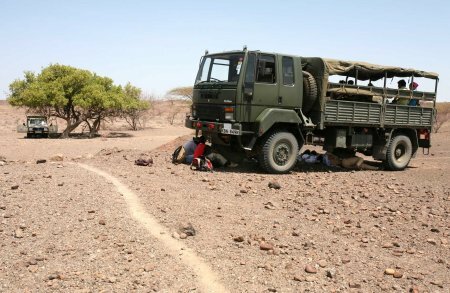 Temperatures have consistently rested around 100 degrees Fahrenheit during midday, and TBI Field School students seek any shade they can while they break for lunch. The underside of the lorry is a favorite spot. 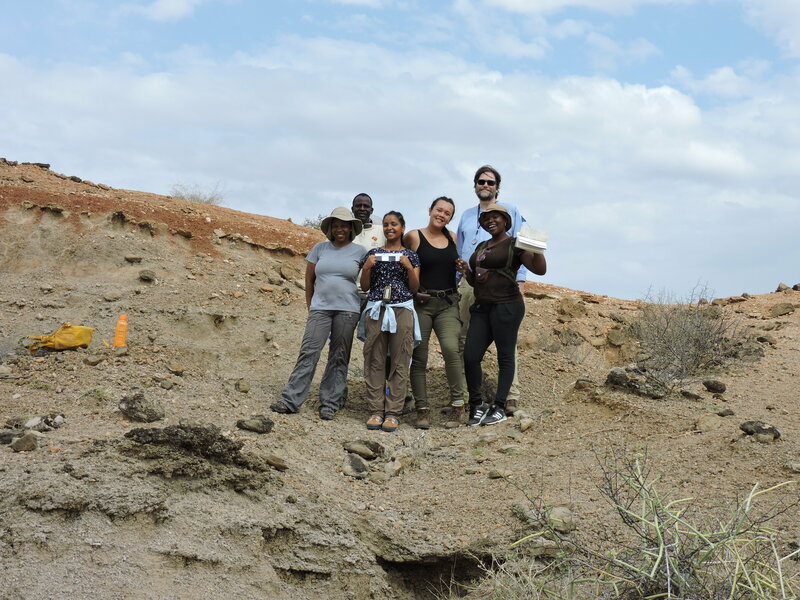 Meave helps Luke, Debbie and Mandy understand the geological history of the Losodok range, and its Kalodirr member. 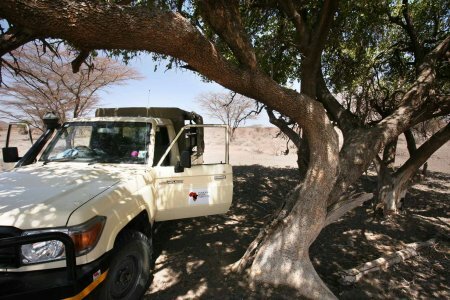 The TBI jeep rests beneath the shade of one tree’s bright, expansive canopy. Lunch was a relaxed affair until a small swarm of bees came to participate in our meal. 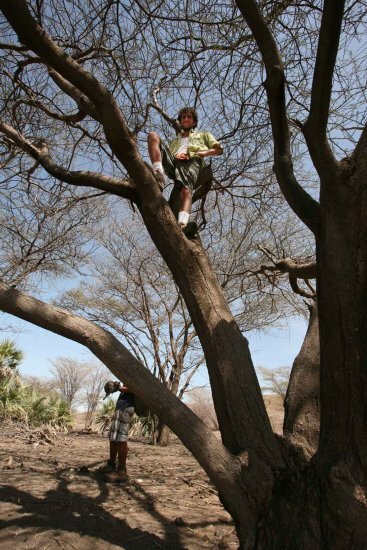 Wyatt climbs an Acacia tree before we set out on our next excursion. Peter looks down on the Eragaleit streambed, students and Losodok peak behind him. The ephemeral Eragalait and Nathura streams have eroded these 25 million year old sandstone and siltstone deposits, leaving exposed fossils behind them. The entire sequence of rocks is bracketed by a series of volcanic rocks called the Kalokol basalts, which help geologists place a firm date on the age of the fossils found within them. 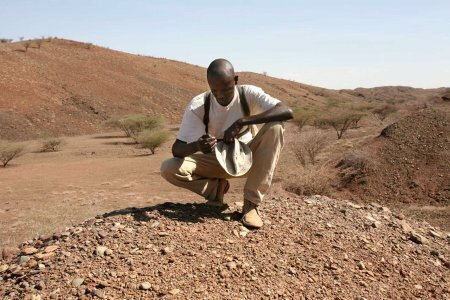 Francis Ekai stops to examine a fossil in Losodok’s Eragaleit beds. 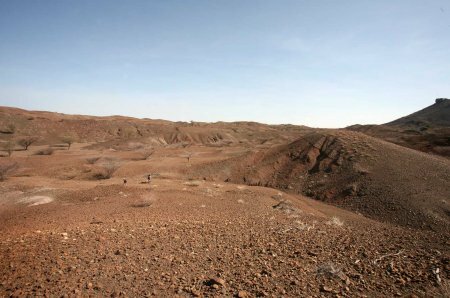 Not far to Francis’ left are a series of deep red sands and silts that are famous for containing fossils. To his right can be seen Eragaleit’s dry streambed. 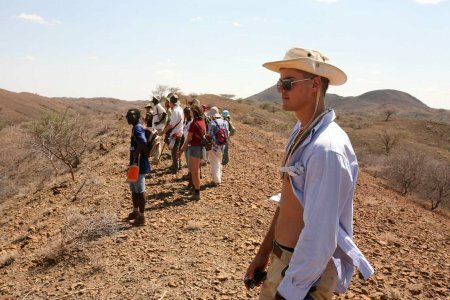 The afternoon wearing on, students begin their last trek across Losodok before heading home. Losodok peak can be seen in the distance.